This One Didn”t Get Away! 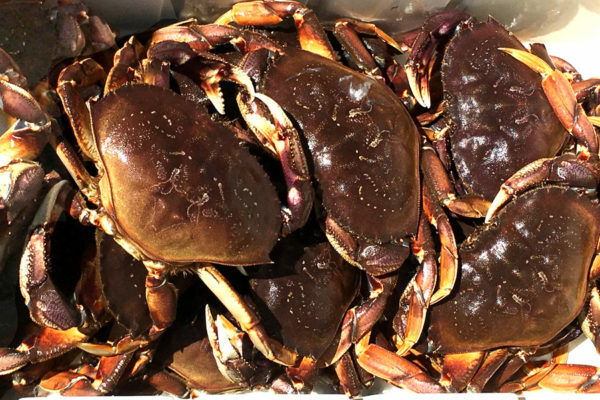 I am Deb – ‘Halibut Queen’! 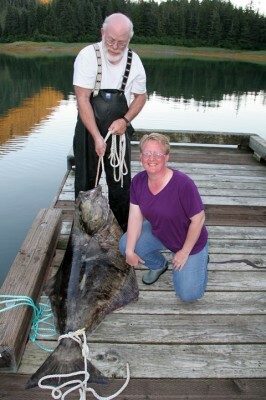 July 29, 2006: We were fishing Holkham Bay, Alaska for Halibut. 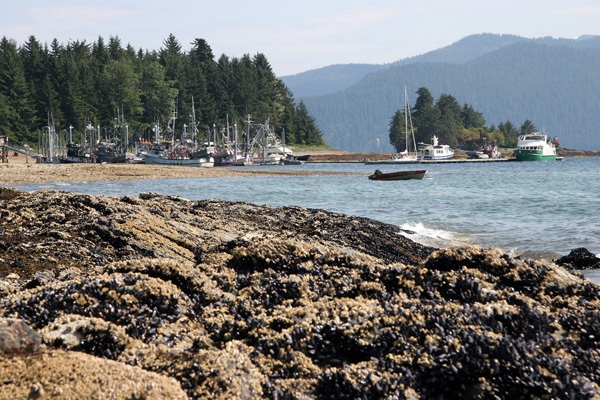 In contrast to salmon fishing, we used Kevlar fishing line and two very large fish hooks per line that we baited with Herring. We were in 130 feet of water and I was using a 32 ounce weight to take my line to the bottom since we were fighting a pretty strong current. This picture shows the rig we were using with the spreader bar. 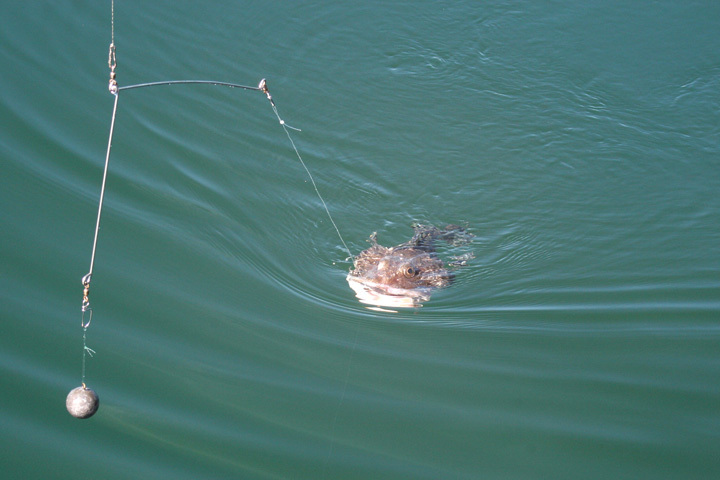 The picture of the sculpin shows the rig we were using with the spreader bar. We set the sculpin free again by shaking it back in the water before it was too stressed to survive. I caught two halibut earlier on this same day and they both got away. One was only about 30 pounds and shook the hook before we could ‘gaff’ it. The other was bigger and just as I got him to the surface and we were preparing to ‘gaff’ him, he broke the tackle line (one of the lines to the two hooks) then swam away in a big hurry with my hook and bait. I was bummed but kept trying. Dan helped me re-bait the hooks and I put it back in the water. 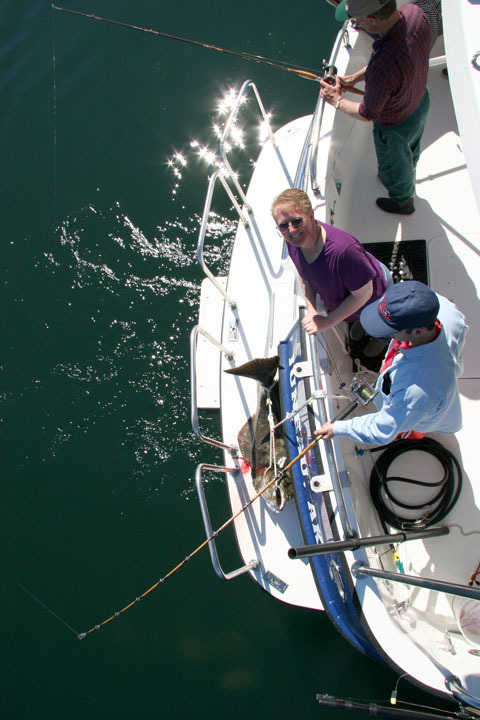 I waited as I watched the others pulling in 10, 20 and 30 pound Halibut while I was only getting nibbles. Fred, Dan, and Ed getting the rope around the tail fin of the Halibut. After a few minutes of no action on my line, I decided to pull my line up to check the bait. I started reeling the line in and didn’t get very far when…uuuugh…it simply would not pull up anymore. Then my line started pulling out and I was having trouble holding it and reeling at the same time. Joel noticed my predicament and asked if I needed help. I nodded emphatically and answered in a rather choked voice, “YES…PLEASE!” He jumped in, and together we got it on its way up. At one point, we thought that my line was just caught on something like the fish had wrapped it around the anchor line but we kept working on it unwilling to give up. This Halibut was so big that it had to stay on the swim deck! After a while, Joel traded with Andy; but I was determined to see this fish to the “net” (which was actually a harpoon and then a large rope). So Andy and I continued pulling up on the pole and I would frantically reel down…again, pulling up on the pole and I would frantically reel down. This went on for what seemed like ten or fifteen minutes. Just as I was beginning to get too tired to keep going, somebody yelled some expletives and pointed as they said, “That is one BIG FISH!!! !” I managed to turn my head just enough to see what they were talking about and sure enough it was a BIG FISH! Me looking over my Halibut on the swim deck. With Andy coaching me how NOT to lose it by keeping the fishing line tight so the fish could not head back to the bottom or worse…shake the hooks…we held on to it and kept the line tight until Dan and Fred were able to get the harpoon into it. 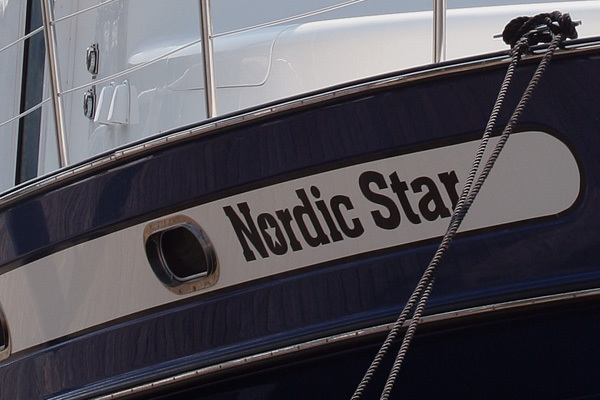 Then we were able to relax a very little bit but had to stay on guard just in case the harpoon did not hold. Dan and Ed managed to get the large white rope around its tail and secure it better. Then Dan used his newly invented “fish needle” to ‘thread’ the loose end of the rope that was around the tail through the gills and secure it better. Finally, I could fully relax when they were able to remove the hooks and release my pole (which was actually Dan’s pole). 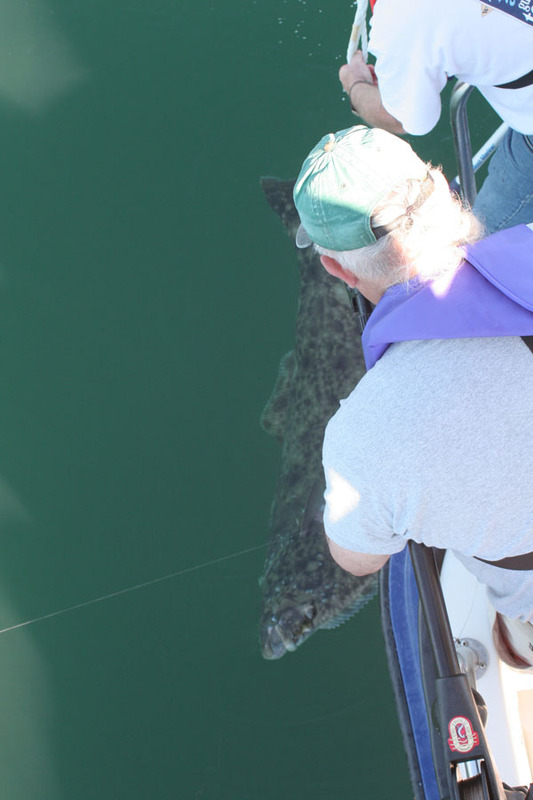 As soon as we released the tension on the line, the hooks fell out with the bait still attached. PHEW…what a close one! This one didn’t get away! That was fantastic!!!! Before we filleted it, we measured it one more time for accuracy. It was slightly longer than 63.5 inches which translated to 134.00 pounds per a standard conversion chart. After it was filleted, we were to have gained 109.00 pounds of fish meat from it. 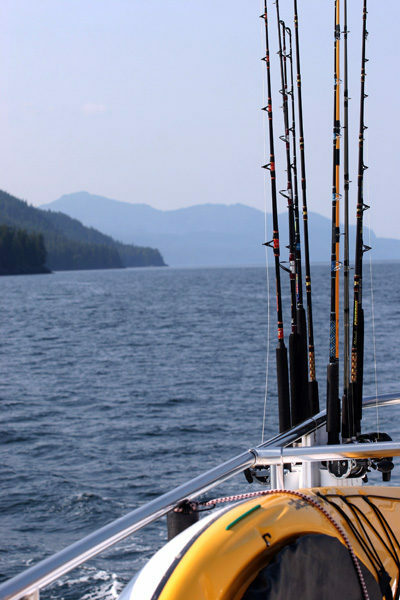 I STILL want to go fishing in Alaska again as soon as I get another opportunity; although, it is going to be really hard to beat this experience! 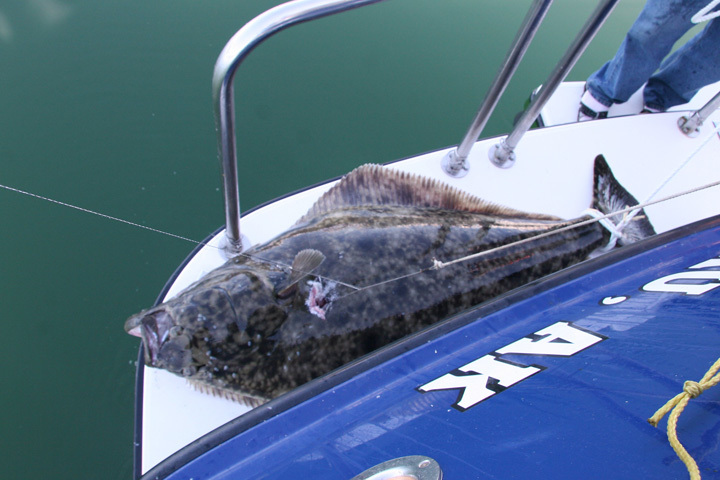 I like salmon fishing; but I thoroughly LOVE Halibut fishing!! !